The purpose of this chapter is to discuss the operation principle of an OTDM-WDM transmission system. It provides a clear picture about all building blocks of the OTDM-WDM transmission system. 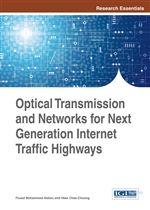 It also contains descriptions of various techniques that can be used to generate ultra short optical pulses for OTDM system. The basic principles of multiplexing and demultiplexing and filtering processes are explained by a discussion of several practical scenarios related to OTDM-WDM transmission system. Time Division Multiplexing (TDM) in the optical domain is often called optical time domain multiplexing (OTDM) to differentiate it from electrical time domain multiplexing (ETDM) where the same process is performed in the electrical domain. The basic operating principle of OTDM is shown in Figure 1. In this scheme, the optical transmitters are separately modulated by the signals from different channels where each transmitted laser signal has the same wavelength and operates at the same bit rate, BR,ch. The optical pulses from the transmitters are time multiplexed by sending clock signals with different phase shifts to the transmitters. Alternatively, the phase shifts can be induced through the use of time delay lines. The timing of the clock signals is such that the pulse generated from each transmitter (channel) occupies a different, allocated bit slot within each time period, T = 1 / BR,ch. The overall bit rate is then given by BR = N x BR,ch, where N is the number of individual channels. Thus, the bit slot allocated to each channel has the same time length T and the bit slot allocation pattern is repeated throughout the multiplexed OTDM signal. The time multiplexed optical pulses are then transmitted through the optical fiber. Figure 2 shows an example of Intensity Modulated (IM), Return-to-Zero (RZ) pulses undergoing the OTDM process. At the receiving end, the optical pulses have to be demultiplexed by an OTDM demultiplexer. The outputs of the demultiplexer correspond to the output of each time-multiplexed channel. Each of these outputs would then have to be received by separate detectors. The demultiplexing process is shown in Figure 3. The OTDM process can result in very high speed multiplexed signals with bit rates that can go above 1 Tb/s in some cases (Nakazawa, 2000). The overall speed depends on the number of channels or tributaries that are multiplexed together. Each channel is obtained from the modulation of laser signals using an individual data stream or through ETDM of multiple data streams. Nowadays, the speed of each individual OTDM channel is normally in the range of 10 to 40 Gb/s. This is because the maximum speed of ETDM is limited to about 40 Gb/s due to the limitations of electronic circuits. At present, 10 Gb/s channels are more common since the electronic equipment used to generate such signals are more cheaply available. Therefore, to increase the data rate, there is no choice but to perform the multiplexing in the optical domain. Ultimately, the capacity of the OTDM system is determined by the total speed of the multiplexed signal, which in turn is limited to the speed that we can reliably transmit through the optical fiber, receive and process.